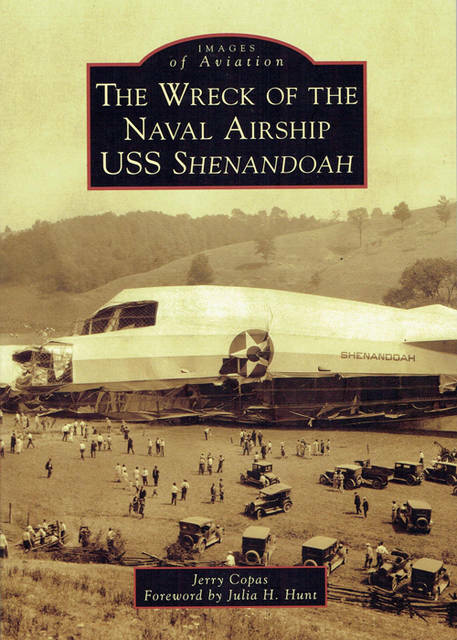 Pictured is the book cover for “The Wreck of the Naval Airship USS Shenandoah” by Jerry Copas. GREENVILLE – Garst Museum will welcome Jerry Copas, author of “The Wreck of the Naval Airship USS Shenandoah” (2017), at 2 p.m. March 31. Copas became interested in the USS Shenandoah many years ago in elementary school after seeing a photo in a book of the ship’s wreckage sprawled out on an Ohio farm in Noble County. Many years later as he was driving through southern Ohio, he decided to see if there was any evidence remaining of the tragedy. After locating the farm and the crash site, visiting the monuments and memorials in the area and interviewing local historians, he envisioned the idea for the book. It is no surprise that Copas would have an interest in airships filled with helium. He himself is co-owner of Images Aloft Balloning, Inc. He has been a balloon pilot for more than 35 years and has piloted balloons in 30 states and seven countries. He is a member of the Balloon Federation of America, the Balloon Society of Kentucky, the Akron Lighter-Than-Air Society, the Naval Airship Association and the Navy Lakehurst Historical Society. He is an author of magazine and newsletter articles on ballooning and aviation history and is awaiting release of his upcoming book, “French Lick and West Baden Springs,” which is due out in 2019. Copas will speak about the USS Shenandoah and Lt. Cmdr. Zachary Lansdowne, who was piloting the Shenandoah on the day that it crashed in 1925. Based on the engineering of the famous German Zeppelins, the airship was a marvel of its day. When launched from the U.S. Naval Air Station in Lakehurst, New Jersey, the USS Shenandoah became the nation’s first rigid airship and the first to use helium gas. Rigid airships were especially vulnerable to bad weather, and the Shenandoah was no exception. On Sept. 3, 1925, while starting off on a 3,000-mile publicity trip to the Midwest, the airship was ripped into several pieces by a storm over Noble County in southeastern Ohio. Fourteen men died, but 29 miraculously survived. On that day, Lansdowne, a Greenville native, went down with his ship. The Garst Museum has an exhibit about Lansdowne, who had been deemed a national hero by the time he appeared on the cover of “Time” magazine on Sept. 14, 1925. The wreck of the USS Shenandoah was front-page news nationwide, and Lansdowne was hailed as a hero who remained at his post until the end. All Garst lectures are free and open to the public. However, regular admission will apply to tour the museum, which includes the National Annie Oakley Center, Crossroads of Destiny, Lowell Thomas exhibit and Longtown display. Funding for this program was made possible, in part, by the Harry D. Stephens Memorial Foundation. The Garst Museum is located at 205 N. Broadway, Greenville. For more information, call 937-548-5250, email information@garstmuseum.org or visit www.garstmuseum.org.